This story has become folklore and several songs were made about it. However, a young apprentice draughtsman, Stanley Edge, was plucked from the shop floor and taken to Lickey Grange, the home of Herbert Austin, where he worked all hours, secretly, designing a small car which Austin planned to sell in direct competition to the cyclecar and motorcycle-combination market, which was done successfully. Much of the work is reputed to have been carried out in the Billiard room hence the story that the size of the Austin Seven related to the size of a Billiard table. 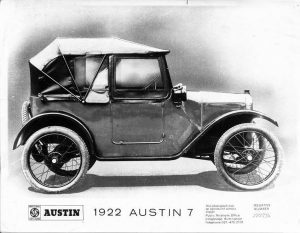 The Austin Motor Company was alleged to have been in severe financial trouble in around 1920 and the Seven has been seen as the saviour of the Company. The Great War had just ended and the Company was having to reduce its size; the Board was less than keen to embark upon a new venture. Herbert Austin had, however, taken out patents on all his new designs in his name and the Board, realising the Austin could, and would, set up on his own agreed to the production of the car. In a relatively short space of time three prototypes were built in 1922, one of which, registered OK 3537 survives to this day. Recently restored it has been displayed in Gaydon, the Science Museum and in Japan. British motoring would have taken a different course if the Seven had not been built. The likelihood would have been the Austin would have ceased to produce cars, there would have been no merger with Morris, no British Leyland and possibly no Rover Group. 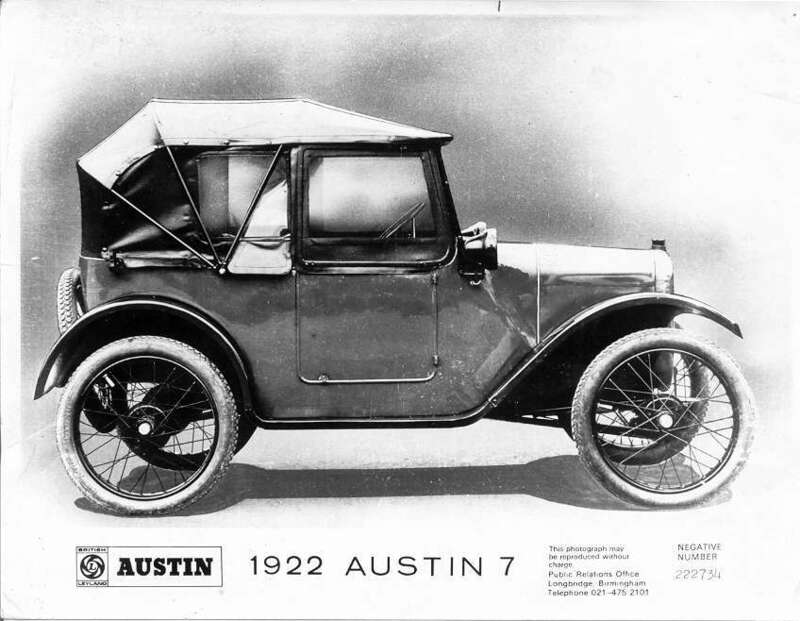 It would have also possibly had an impact on world motoring as the Dixi, an Austin Seven built under license, eventually became BMW; the early Datsuns were outright copies of the Seven and the American Austin company produced the Bantam from the Austin Seven design and eventually used a basic car to produce a Jeep for the American military. In Australia many stylish bodies were produced to fit the Seven chassis including the those made by Holden whilst in France the Rosengart was again based on the Austin Seven chassis. By 1937 the Austin Company realised that the Seven could not continue forever and produced the Big Seven which was loosely based on the Ruby but with a larger engine and 4 doors.